I'm trying to convert a number, say 123.50 to 000012350 (always 10 characters, need pennies but no decimal point. However, the result of the formula will be a numeric string, not a number. If the result should be number, you can multiply the original numbers by 100 to get rid of the decimal point (=A1*100), replace formulas with values if needed (an intermediate result will be 12350), and then apply this custom format: 0000000000 to always display 10 characters with the required number of leading zeros. I'm having trouble formatting text and would like to omit the first two letters. I'm aware that I could use RIGHT(CELL,LEN(CELL)-2) but I don't want to change the actual text, just to display it in a different way, with the underlying 'value' of the cell staying the same. For example, I can type in the custom formatting bar "Rob" to display only "Rob" no matter what I actually type into the cell. Thank you for the fantastic article, it was very helpful and well written. I'm trying to round the number 1,230 to 1,200; or 43,540 to 43,500. Thanks. I need to convert a 00000 type formatted cell content (shows as 00123) to text with same number of leading zeros. Since Excel understands the value only as 123 converting the cell format to text removes the zeros. Thanks in advance. I am trying to format my phone numbers to look like this: 303.555.9876, but instead they look like this:3035559876.. I will like to know how to fix this problem. I NEED TO CONVERT ALL THE NUMBERS THAT I ENTER SHOULD BE IN LAKHS. how to format a cell like: AAAA12345-6? Trying to use Custom Format to color numbers in a cell based on the these conditions: green for 45 but =60. Trying to use Custom Format to color numbers in a cell based on the following conditions: green for numbers less than or equal to 45, amber for numbers greater than 45 but less than 60, and red for numbers 60 and greater. We get a list of numbers in that actually start with a letter (Example L18-021547) and I would like to figure out how to apply a format to those numbers that adds an asterisk (*) to the beginning and the end of that without having to add them to every single field manually (*L18-021547*). We get a bundle of 100+ of these numbers for each report and I am just trying to come up with a way for it to see the field as a number, which it is not doing at the moment because it starts with "L". Any suggests? each time you just need to type out the number and it will add the * and also the L for you. Your request is somewhat confusing because Excel is not going to see "L18-021547" as a number. Then you say you're trying to come up with a way to see the field as a number with an asterisk at the beginning and end of the text. =CONCATENATE("*",A2,"*") will add an asterisk to the front-end and back-end but it will still be text. Excel is not able to convert the letter "L" and the "-" into a number. Why do you need the data as a number? can i know how to remove the decimal point? or did i use the wrong code for it? i want it to have the expending function like how the general give where if you don't have decimal it don't show but if you have then only it shows. Your explanations are so well articulated that I've bookmarked this page for future reference. Hi guys, I need to make a custom currency format same as accounting one, but I need it in ARABIC figures with ARABIC currency symbol "ج.م.". the numbers & symbol should be aligned same as accounting excel format. Any way to do please? 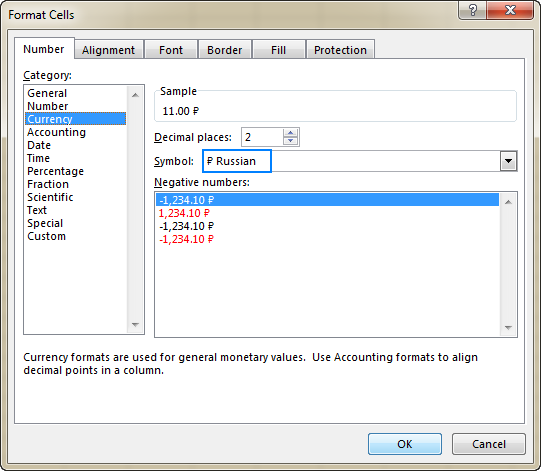 Simply select your data, press Ctrl+1, and go to the Accounting category in the dialogue window that appears. You will see a drop-down menu for Symbols. Pick Arabic (Egypt) from the list and hit OK to save changes. Hi - I need to find a way to change the way my data is being displayed in an excel table that I have... where I have an entry of "00024 01" that is formatted as "General" input... and where the blank space is supposed to represent a decimal point ... my question is, how can I get this entry to display simply as the number "24.01" with no leading zeroes and with the decimal point showing?? What would be the code I put in "Type:"
Thank you for your article, its great and helpful. 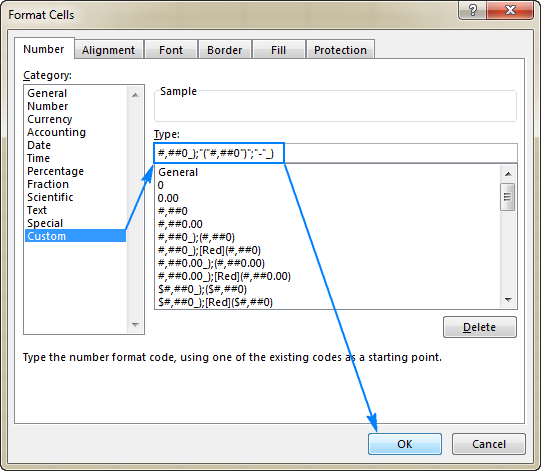 You can learn more about the ways to concatenate values in Excel in this article on our blog. Dmitry, I'm assuming that this is what you're after? I have the following custom code: "3189967-"000 which works fine, however, sometimes I will need the letter "T" to appear after "000" but not all the time. Do you know if this is possible? How to get that in the same cell number is negative regardless of numbers of digits the number is in brackets? Example -1,23 is (-1,23) -1,0 is (-1) -23,5698 is (-23,5698) 1,23 is 1,23 2,695 is 2,695 all can be in same cell. I tried #,###; (-#;###) but this returns (-1,). I am trying to have text display in a cell that displays with a leader. The text within the parentheses needs to display in italics. When I apply the custom format for a leader in the cell (@*. ), it removes the italics from the text in parentheses. I am trying to type a number starting with zero. How to type a number starting with zero. When using accounting format, true zeros display as a dash, but numbers that round to zero display as a zero, so visually you see a column showing some zeros as - and others as 0. Is there a format to make them all display as a dash without using rounding to change the numbers? I try to format percentage and keep a digit, if the digit is 0, remove it. How do I remove the dot as well? I would like to display the currency in cell D10 which is R 1 345 678,93 in say Cell B6 with preceding text "Order Book Value is". If I use ="Order Book Value R"&D10 I get "Orderbook Value is R1345678,93". How do I get the custom formatting to format the value to look like that in D10. I have tried various custom format combinations, but to no avail!